In the area of attitude software, several multimission support, programs have been developed at Goddard Space Flight Center. At the present timie, however, most of the standardization has come at the level of subroutines, system components, and relatively small utility programs. For example, the Graphics Executive Support System described in Section 20.2 has proved to be a very valuable executive for systems using interactive graphics and is used for most mission support systems. ters, operates in four coordinate systems, and requires considerable analysis to set up for a particular mission. In addition, sensor simulation is time consuming (both analytically and in computer time) because it must follow a more general procedure than is permitted for a system designed to work with specific, known components which have well-established frequencies associated with them. I The Optical Aspect Bias Determination System, OABIAS, has been used to support bias determination activities for eight missions and has been modified and expanded to become the bias determination subsystem of the CTS attitude system (Section 21.2). Although OABIAS has been successful in supporting diverse missions, it is limited to spin-stabilized spacecraft using Sun sensors and horizon sensors. Thus, the system can support only a limited class of hardware and cannot be used for three-axis stabilized missions. The Multi-Satellite Attitude Prediction Program, MSAP, has supported a greater variety of missions than OABIAS because it is modified for each new spacecraft to take into account the aerodynamic drag and control laws for each specific mission. Of course this reduces the versatility and efficiency of the system because considerable analysis and programming is required for each new mission. The generalized software systems have had only limited success, primarily because of the widely varying types of hardware and mission constraints. Generalized software capable of satisfying varied requirements will contain more options and control parameters than any one spacecraft will use. General software is more difficult to design; requires more core storage; and is generally more complex, inefficient, and expensive (although the cost may be spread over many missions). Even though there are substantial advantages to generalized software, it is unlikely to become widely used until spacecraft hardware becomes more standardized. Basic Analysis. Because the fundamentals of attitude determination and control have been studied for only a few years, considerable future effort will be required to expand and systematize our knowledge of attitude-related activities. These analytic needs may be divided into five overlapping categories: (1) data evaluation and bias determination; (2) filtering theory and computer processing techniques, both ground based and onboard; (3) spacecraft dynamics; (4) environmental modeling; and (S) attitude geometry, including'attitude accuracy and bias observability. In the area of data evaluation, we need to determine what quality assurance procedures are appropriate for data from autonomous spacecraft; what data should be telemetered by the onboard computer to optimize thé division between onboard and ground-based functions; and how the ground-based software should process and react to these data. We would like to understand how to formalize the process of identifying data anomalies as described in Chapter 9. We need to determine which bias parameters can or should be estimated and what constraints should be placed on an attitude state vector to obtain "reasonable" answers in the presence of systematic residuals. We also need improved sensor models, including the operational evaluation and refinement of the horizon sensor electronics model described in Section 7.4 and further development of star sensor instrumental magnitudes discussed in Section 5.6. In the area of estimation theory, we should improve our understanding of the behavior of estimation algorithms, particularly when the errors are dominated by quantization. Similarly, we need to determine how best to estimate attitude parameters in the presence of large systematic residuals, because systematic errors are ordinarily the limiting factor in the attitude determination process. This understanding should lead to improved standardized procedures for processing attitude measurements with standard estimators. A better analysis of the effect of preaveraging on subsequent state estimation is necessary to provide a high-quality two-stage filter. The goal here is an estimator consisting of a preaveraging stage which reduces the data volume to a manageable level while retaining as much of the original information content as possible, and a second stage which is a complex estimator of the type described in Chapter 13 that can be iterated many times on the preaveraged data to find the best available solution. Another state estimation problem is to find the best balance between onboard and ground processing, such that the economy and strength of both methods can be fully utilized. This includes estimation techniques for onboard processors and the choice of bias, calibration, or environmental parameters to be supplied to the onboard processor by ground-based systems. In the area of spacecraft dynamics, much of the current literature is related to stability and control of complex systems; this literature is the best source of information on future requirements. Additional work is also needed in the identification and modeling of . internal disturbance torques, as described in Section 17.3, and in obtaining simple, approximate relations in flexible spacecraft dynamics (see Section 16.4). We should obtain a better understanding of the impact t>f spacecraft dynamics on attitude accuracy as more stringent requirements develop. A more complete analysis of the approximate effect of small amplitude nutation on both observed data and attitude solutions (as described in Section 16.3) would be useful. 17.2. For torque computations, models of the Earth's atmosphere which do not require frequent input of observed data would be valuable, but may be impossible. 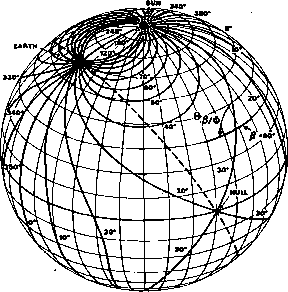 Improved models of the Earth's horizon, as described in Section 4.2, are needed; these would include variations in the infrared radiation profiles and models of the variations in the COz layer which incorporate the effects of weather and horizontal temperature gradients. Particularly important here is an evaluation of real spacecraft attitude data obtained together with other high-accuracy attitude data, such as that from star sensors. Further development of star catalogs and star positional data, as described in Section 5.6, will become more important with the increasing use of star sensors as an accurate attitude reference. 14.3, is required. Convenient procedures for representing the time variations in the geomagnetic field (as sensed by the spacecraft) or the long-teirn position of the Sun for Earth-oriented spacecraft would be useful in mission planning and analysis. We should also obtain more information on the spherical geometry characteristics of attitude determined from multiple nearby sources, as in the case of star sensors or landmark tracking. A reliable and systematic procedure is needed to incorporate geometric error analyses into attitude solutions and uncertainty computations. Finally, we should undertake a systematic evaluation of the relative advantages and disadvantages of various hardware types and possible attitude reference vectors. This would include particularly the use of landmark tracking data and the observability of both orbit and attitude parameters from "attitude" data taken on board the spacecraft. This could lead to an autonomous orbit/attitude system. Summary. There are two major goals in spacecraft attitude determination and control in the Space Shuttle era: (1) reliable, flexible, and economical coarse attitude determination for attitude acquisition, orbit and attitude maneuver control, and attitude determination and control when requirements are not stringent; and (2) reliable, high-accuracy procedures for semiautonomous attitude determination and control, probably using landmark tracking for Earth-oriented spacecraft and star sensors or payload sensors for other missions. Such systems should use hardware that can be analytically modeled and onboard routine processing using calibration, bias, or environmental data supplied by sophisticated ground-based systems. Achievement of these goals will necessitate some degree of hardware standardization, which is a precursor to standardization of software and processing techniques. The support of common systems should provide an opportunity to develop a more basic understanding of attitude-related problems, rather than continually redeveloping and revising procedures to ensure the success of individualized missions. Another major problem to be overcome is that of improved communication between the frequently discrete groups working in the area of attitude determination and control—that is, those primarily involved with hardware, stability and control theory, and ground processing and attitude support. A major goal of this book is to provide some common background so that we can reduce the communications barrier and improve our mutual understanding. 1. Chen, L. C„ and J. R. Wertz, Analysis of SMS-2 Attitude Sensor Behavior Including OAB1AS Results, Comp. Sc! Corp., CSC/TM-75/6003, April 1975. 2. Chen, L. C., H. L. Hooper, J. E. Keat, and J. R. Wertz, SIRIO Attitude Determination and Control System Specifications, Comp. Sc. Corp., CSC/TM-76/6043, Feb. 1976. 3. GSFC, Low Cost Modular Spacecraft Description, NASA, £-700-75-140, May 1975. 4. Massart, J. A., Preliminary Assessment of the COS-B Attitude Measurement System and Attitude Control System and the Related Ground Software, ES A Doc. No. ESOC/OAD-WP-50, March 1976. 5. Proise, M., Fine Pointing Performance Characteristics of the Orbiting Astronomical Observatory (OAO-3), A1AA Paper- No. 73-869, A1AA Guidance and Control Conference, Key Biscayne, FL, Aug. 20-22, 1973. 6. Smith, Sterling R„ editor, Applications Explorer Missions (AEM) Mission Planners Handbook, GSFC, May 1974. 7. Werking, R. D., A Ground Based Attitude Support Plan for the Solar Maximum Mission, presented at the Goddard Space Flight Center Flight Dynamics/Estimation Theory Symposium, May 5-6, 1976. 8. Wertz, J. R., "The Optical Slit Sensor as Standard Sensor for Spacecraft Attitude Determination," Flight Mechanics/ Estimation Theory Symposium, compiled by a Carmelo E. Velez, NASA X-582-75-273, p. 59-68, Aug. 1975.